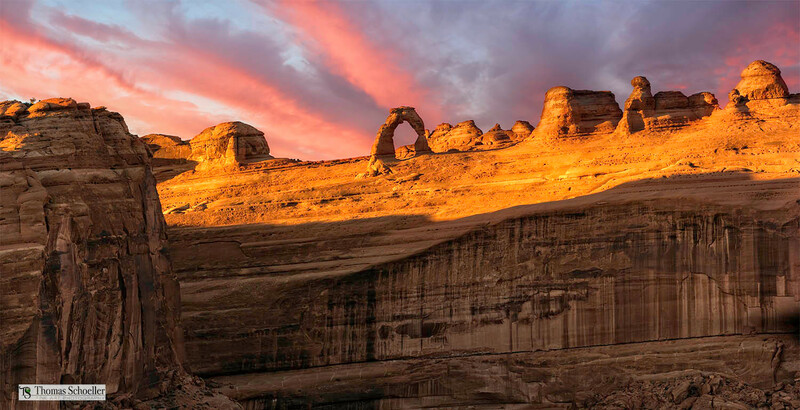 An amazing colorful sunset over Delicate Arch in Utah's wonderful Arches National Park. This is a sharply detailed HD print. I photographed this scene from near the Delicate Arch south viewpoint. I hiked eastward along the ridge, far from the tourist viewing pad for a unique view. I had a spectacular look into the deep chasm that is known as Winter Wash. I set up my gear and patiently waited for the sun to dip low and the shadows to lengthen. The 64' high natural Arch is dwarfed by it's surroundings. This artwork prints to a 2:1 aspect ratio beginning with our smallest wide ratio print size of 20x10". We then offer a variety of 2:1 aspect sizes up to a massive 60x30"